The Dieline has the exclusive images of this year's Pentawards. 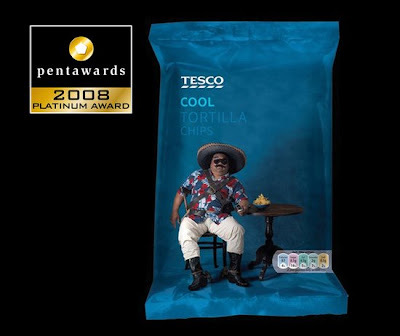 The Pentawards is an international design contest devoted to package design. The package designs are a great mix of work from around the world showing the best of the best. Congratulations to Andrew Gibbs and his blog The Dieline for bringing us these great package design images of the winners. I had the pleasure to attend the Event Design Summit 08, presented by Event Design Magazine, in Hollywood the past few days. The conference was great!! The depth of information about design that was presented was current and extremely useful on all fronts. The summit was presented in a small and intimate environment, the atmosphere that was set up allowed for a comfortable and approachable interchange with the attendees and speakers. The line up of presentations covered a vast amount of territory from dealing with current economic situations, ways to keep your creative juices flowing, to interactive designing. I would like to personally thank the presenters that I saw; Tim Kobe and Wilhelm Oehl from Eight Inc., Deanna Kuhlmann-Leavitt from Kuhlmann Leavitt, Mitchell Mauk from Mauk Design, Hans deWit from Wit Design, Jack Rouse from Jack Rouse Associates, Alero Akuya from Nike, Tom Bowman from Bowman Design Group, Jan Lorence from Lorenc + Yoo Design, Jeff Lake from Hamilton Exhibits, Scott Powers and Man One from Man One Design. Each of these presentations gave me information that I can put to use today with critical insight and in the future through the exploration of design. I wish I would have been able to attend the other presentations but like any conference one has to pick and choose. The Event Design Summit team will post presentations up on line next week so we can see what we missed out on and have any information we missed from those we attended at this link. 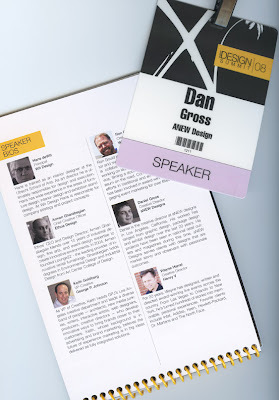 I would like to say a big thank you Dan Hanover, Editor and Publisher of Event Design Magazine for giving me the opportunity to speak at this wonderful event and for putting together this exceptional conference. Dan Hanover and his team put on an exceptional event. If you missed this spectacular conference please keep your eyes open for next year. You will not be disappointed. 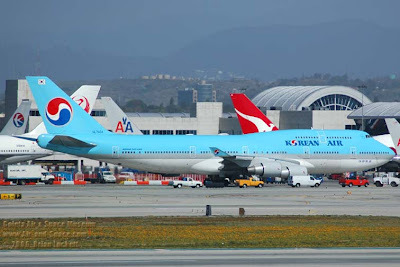 Pepsi Logo is Korean Air Logo? To add more speculation to the Pepsi logo, it reminded me of the Korean Air logo. Pretty close huh? 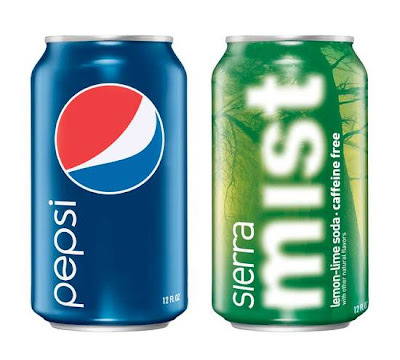 View more about the "new" pepsi logo at this previous post. 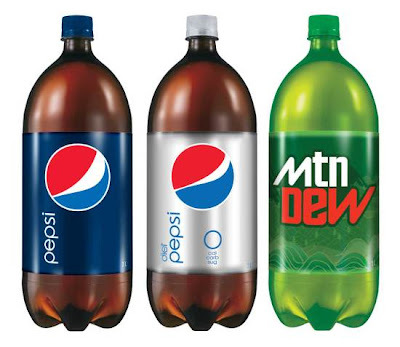 UPDATE- To see a new logo even more like the "new" Pepsi click here. It is final, Pepsi is changing its logo to this new "smile". I am not sure I see the smile and I think it cheapens the brand and looks more like a store brand. I am sure we will hear more as it is released on products the end of this year or early next. Read more about this change at the dieline.com, brand new, and this site that has a promo film released by Pepsi for the new logo. So what do you think of this change? 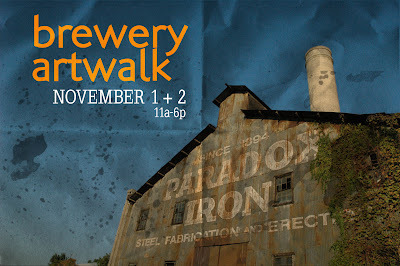 November 1 and 2 will host the Fall Brewery Artwalk in Los Angeles this year. 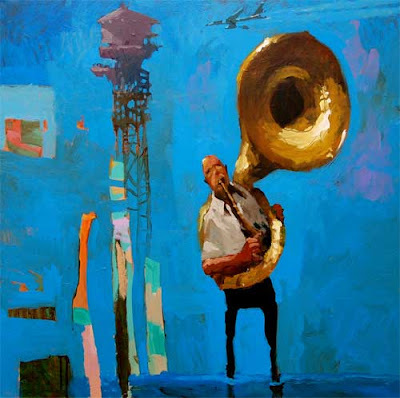 This two day event allows you to view great art from 100+ resident artist all in one location. 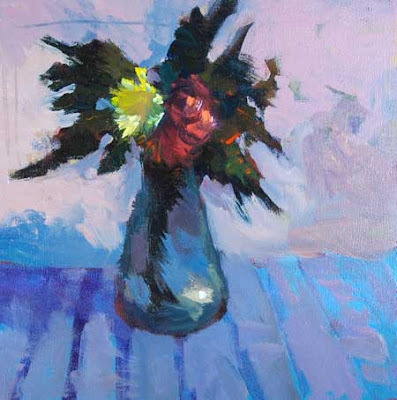 My dear friend, Mike Tracy will have his studio open and has some wonderful new pieces for sale. The painting above are done by Mike. 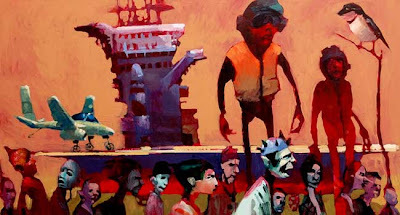 Artwalk is always a great day to see the LA art scene. 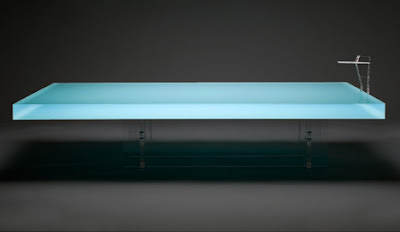 This concept design for a coffee table was thought up by the UK firm of Freshwest. 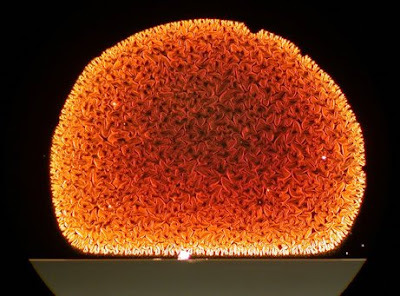 This design was presented at the recent London Design Week. 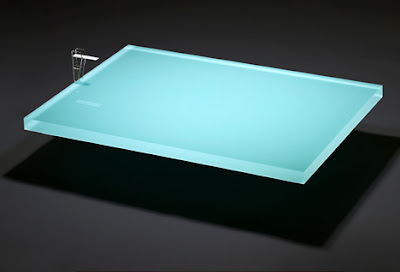 The table is constructed of 50mm acrylic that refracts light to resemble the color and depth of a swimming pool. 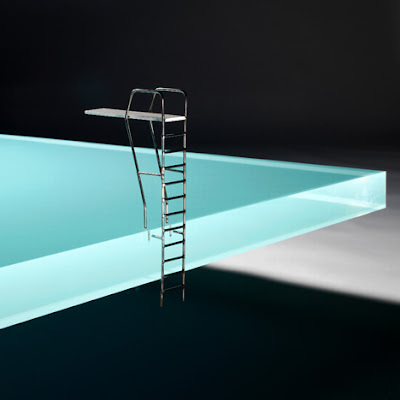 A miniature diving board is added to complete the effect. I hope it goes into production, it will make a nice statement in one's pool house. Now I need to get a pool house and a pool so I will be ready to buy it. This week October 19-25, 2008 is National Design Week. This yearly event is sponsored by the Cooper-Hewitt National Design Museum in NYC. Through out the week, design events are scheduled across the country to celebrate our craft. To view local events check out the National Design week site. 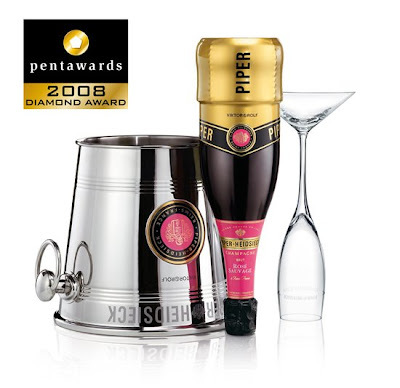 The National Design Awards for 2008 are also celebrated and you can vote on the People Choice Design Awards. Enjoy your week fellow designer! These ads come from Sweden and the recent Polar Music Prize. 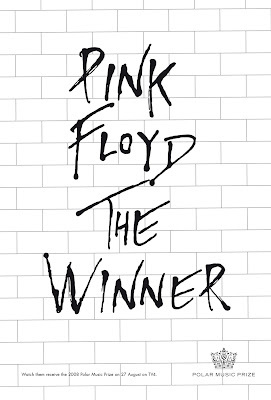 The posters are to promote Pink Floyd winning the Polar Music Prize on a local TV network. 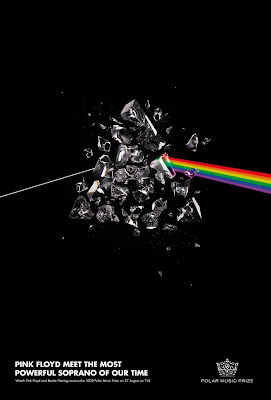 Pink Floyd has been one of my favorite groups for longer then I want to admit and I enjoy the sensitive use of Floyd images for this series. 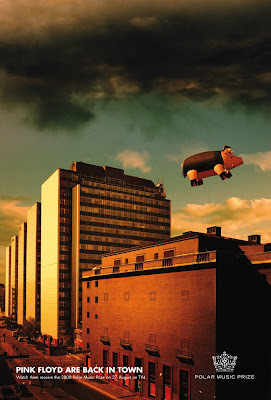 The advertising agency Storakers McCann with Art Director Henric Almquist designed this series of posters. Joe, Joe, Joe. Joe the Plumber, Joe Sixpack, G.I. Joe, Average Joe, Senator Joe, I just had to make a poster of Joe. 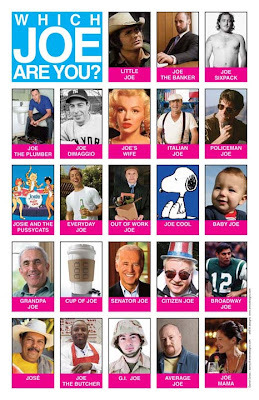 Download a free pdf version of my "Which Joe Are You?" poster. Print it out and pass it around to all the Joes you know. 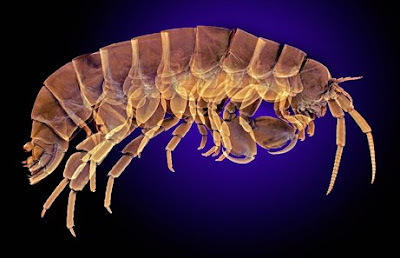 View the best microscopic images for 2008 presented at the National Geographic website. See parts of our world that we miss everyday with these photos. The images are amazing of things so small. To view more go to this link. 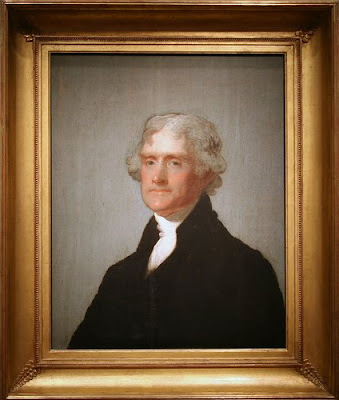 For more historical political ads check out the Living Room Candidate website presented by the Museum of Moving Image. The site features ads from the 1950 until today. The Election Season is hot. 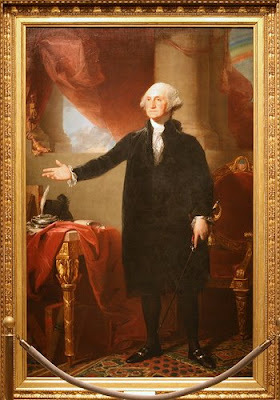 I wanted to share some great portraits of past presidents from the National Portrait Gallery in Washington DC. The NPG is a part of the Smithsonian, one of America's greatest museums. View this series of Portraits at this link. 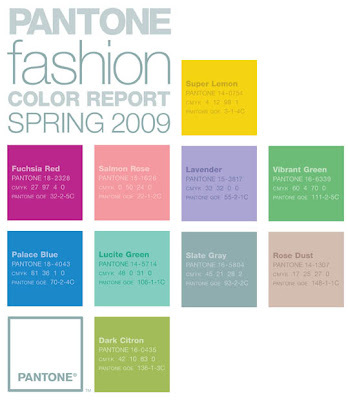 Pantone has released its 2009 Spring Color Forecast for fashion. As designers, we all understand how much fashion can have an influence on our projects. If Pantone is one the money this year, it looks like Fuchusia Red and Palace Blue will start to show up as trendy colors. 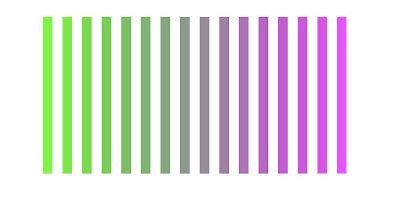 To download a pdf article with the colors go to this link on the Pantone site. The economy has to get better at some point. 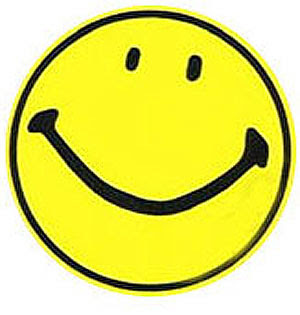 Until then here is an article about the Smiley Face and its creator Harvey Ball. It turns out that Harvey created the original Smiley Face for an insurance company who was going through a merger and they where trying to boost morale. To read the article check it out here. I think we all could use a little fun this week with our 401Ks taking a dump. Check out this site, colorisrelative.com. Scroll over the window and the color changes. At the bottom you can switch to other pages. Enjoy. -The tour participant is provided with special clothes and footwear, and respiration masks. 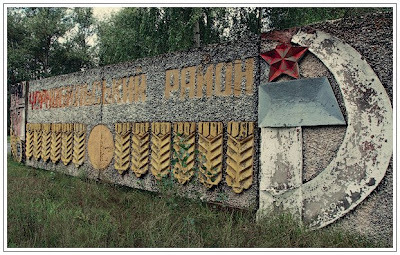 -On entering and leaving the 30-kilometer zone, the participant undergoes a radioactivity testing and is given an official computer-generated printout. -For the time of the tour, the participants is given an individual radiation dosimeter; personal dosimeters are also allowed. 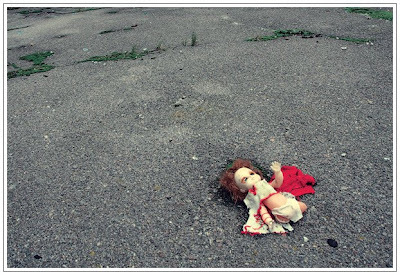 -Taking pictures and shooting video during the tour IS permitted. 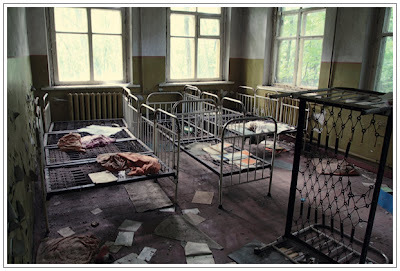 You can see the results of this horrible accident and a glimpse of life in the USSR as it was 22 years ago. 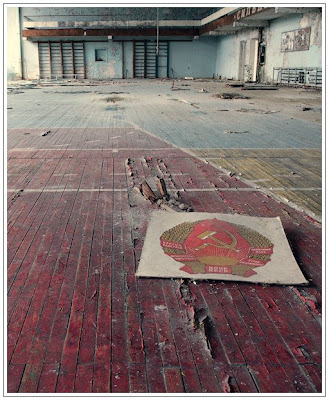 Alexandr Vikulov took the above photos during his tour and the results are a wonderful series of images that can be view at this link. Pack your bag and camera, it definitely should be different. 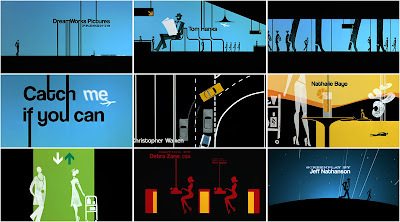 Title sequences for films have been a quiet art in the design world. 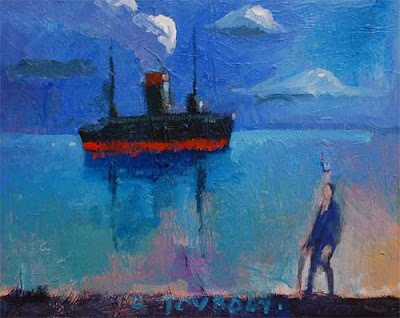 Titles started to take off in the 1960s as an art. Think back to the titles done by Robert Brownjohn for Goldfinger. Recent great titles such as "Catch Me if You Can" where fun and set the stage for the film. Today, After Effects helps move this process along but has also allowed us to explore in new and different ways. A blog, The Art of the Title Sequence has a growing list of titles for you to view and comment on. 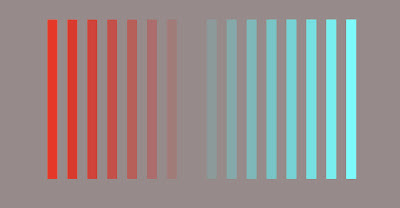 Go to this link for The Art of the Title Sequence to see and explore this quiet art. It is well worth the visit. One thing I seem to have gotten addicted to is Photoshop Brushes. I just love them. They are wonderful to help get that effect you are looking for on the project. If you are looking for a site with Photoshop Brushes check out this great site, qbrushes.com. The selection and range of free brushes is great. I have to get back to my fun in Photoshop now. 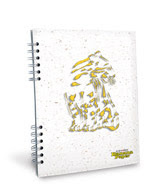 Looking for a new notepad or sketchbook in the near future? Looking to buy something that helps save a tree and uses water based inks in the process? I have found the answer at Banana Paper. This small company located in Costa Rica uses recycled material from bananas and coffee plants to produce its products. Since 1992, TNF Eco Papers – well known in Costa Rica as “ The Banana Paper Company ” – has produced fine environmental, tree-free, acid-free, eco natural paper and paper products from natural fibers, such as Banana, coffee, pine apple, and other exotic tropical agro industrial wastes. 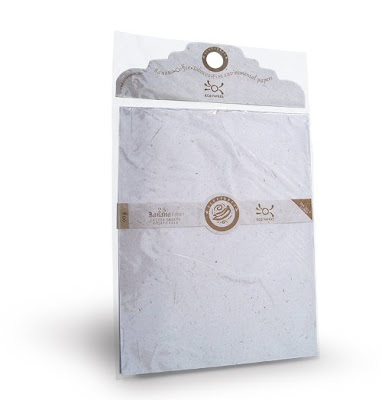 All of our processes and raw materials to make our Banana Paper products are Earth friendly, converting agricultural by-products and post-consumer natural paper into state of the art paper stationery, including banana paper notebooks, banana paper pads, banana paper envelopes, and other fine banana paper gift products, which are manufactured in total harmony with nature. 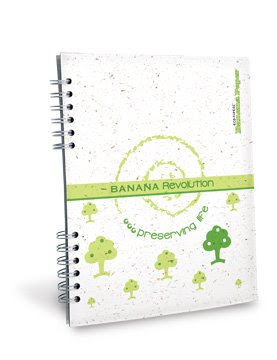 Check out Banana Papers at this link to go earth friendly with your stationary needs. It was 60 years ago that modern Israel was founded in 1948 and this week marks the Jewish New Year of 5769. 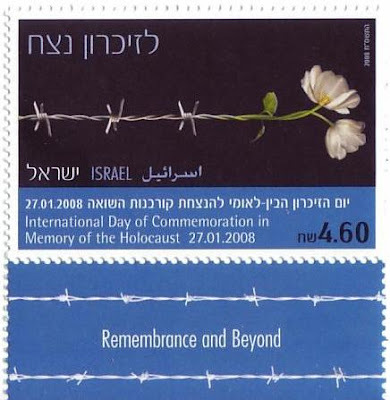 In honor of this I wanted to review a few stamps that Israel has created over the past few years. 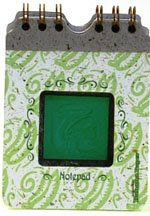 This first stamp is in celebration of the 60th anniversary. 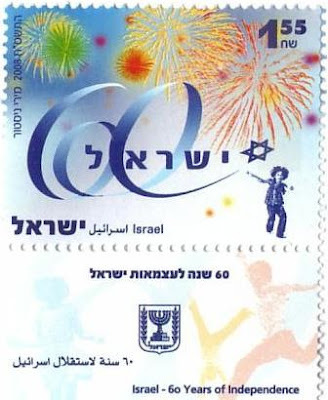 The stamp shows a child making a 60 out of a ribbon. 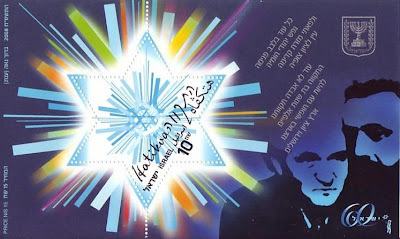 The design is creative and shows the youthful spirit that is Israel. You can feel the movement created in this image. The International Day of Commemoration in Memory of the Holocaust is shown through this wonderful graphic of barbwire and a flower. The design is simple and powerful of the slogan, Remembrance and Beyond. Let us never forget. Israel is a progressive country yet understanding of it's rich history. 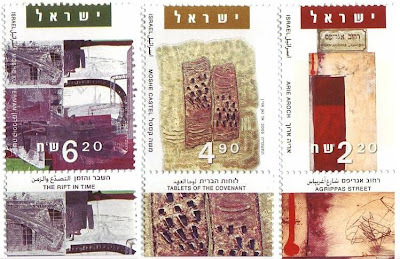 These additional stamps show some of this tradition and look towards the future. Shana Tova.